Dental implants placement is often limited by the anatomy of the alveolar bone. Patients often lose their teeth due to alveolar bone resorption, tooth extraction, trauma thus making it difficult to place implants in an optimal prosthetic position. The loss of width of the residual alveolar ridge that is needed to place implants often needs a remodeling of the lost dimensions. This case reports the successful management of such a patient where the placement of implants possible by autogenous bone block graft techniques obtained from the external oblique line of the mandible with predictable osseointegration and implant stability. Acta Stomatologica Marisiensis is an official Journal of the University of Medicine and Pharmacy Tirgu Mures, Romania, and is published twice a year. 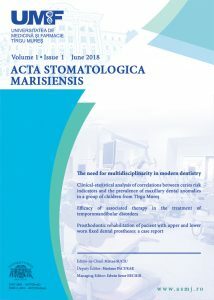 Acta Stomatologica Marisiensis is an international journal dedicated to publishing high-quality peer-reviewed articles about all fields of dental medicine.